VeraSci attended the 6th Annual Diversity Alliance for Science West Coast Conference, February 20th-21st in Laguna Beach, California. VeraSci is honored to participate in one of the leading organizations in the life science and healthcare industries which promotes the economic growth of small and/or diverse businesses and improves the quality of patient care by fostering intimate relationships between those businesses, and corporations, academic, and governmental agencies. This conference included many meaningful takeaways and presentations. Quita Highsmith, Genentech- Head of Alliance and Advocacy Relations, Co-Lead for Advancing Inclusive Research, presented on the importance of “Advancing Inclusive Research.” This presentation stressed the importance of minority groups participating in clinical trials and DNA tests (23andMe, Ancestry, etc.) to collect DNA databases to better diagnose. Gregory Barnes, Amgen- Exec Director and Chief Information Security Officer, presented on “Cybersecurity.” This presentation emphasized the importance of cybersecurity, increased threats to our data, and the need for multi-factor identification and DMARC. Finally, a panel of former drug and alcohol addicts, joined Tommy Begres, Director Clinical Affairs- Adapt Pharma- maker of Narcan, and Anthony Perez, Regional Healthcare Director, Walgreens, to discuss “The Opioid Crisis- Impact to Innovation.” This discussion focused on the opioid epidemic and what needs to be done to change this moving forward. We can’t wait to see what next year brings! Clinical drug trials in preclinical AD populations require novel approaches to participant identification, screening, and enrollment. Execution of these trials requires rapid development of cognitive screening instruments that are straightforward, sensitive to disease-specific pathology, and allow for the interpretation of findings over time relative to demographically age-matched normative samples. Based on an established body of literature linking declines in hippocampal-dependent learning with the earliest stages of AD pathology, VeraSci has worked in conjunction with leading academics to develop a novel assessment of visuospatial working memory (VSWM). In a recent validation study enrolling 175 healthy young adults (<55 years), 320 healthy older adults (≥55 years), and 70 individuals with subjective cognitive decline, statistically significant differences were demonstrated among the three groups for the visuospatial working memory total score, as well as the Sequential and Random subscores (p<.001 for all). Bonferroni-corrected post hoc tests showed a significant difference between the young adult group, the older adult group, and the group with subjective cognitive decline, with the older adult group performing significantly worse than the young adult group and the subjective cognitive decline group performing significantly worse than the older adult group on three measures (p≤0.001 for all comparisons). 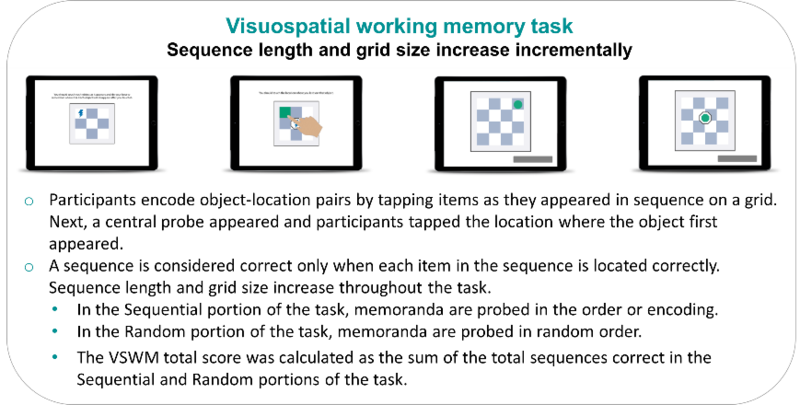 These findings suggest that this tablet-based visuospatial working memory instrument may be sensitive to the earliest stages of cognitive impairment. The specificity of observed declines in hippocampal-dependent tasks such as this offer a link to underlying Alzheimer’s disease pathology not provided by more global cognitive screening instruments. The validation study of the visuospatial working memory test was conducted in the VeraSci Innovation Lab, located in the company headquarters in Durham, NC. The ongoing mission of the Innovation Lab is to produce scientifically-valid, innovative methods for cognitive, functional and clinical assessment in clinical trials across multiple therapeutic areas. This data was initially presented at the 11th Annual Meeting on CLINICAL TRIALS ON ALZHEIMER’S DISEASE (CTAD). Clinical trials in mild to moderate Alzheimer’s Disease (AD) rely on informant reports to characterize study participants’ performance on basic and instrumental activities of daily living. As clinical trials move earlier in the AD continuum, however, these informant-based methods become very problematic. Unlike participants with mild-moderate disease, participants in primary and secondary AD prevention trials are generally healthy, often cognitively normal and largely independent. Thus, these informant-based assessment methods lack sensitivity to the subtle declines in instrumental activities of daily living in this patient population. Also, the inclusion of an informant in study designs is unnecessary, burdensome and may compromise enrollment. The Virtual Reality Functional Capacity Assessment Tool (VRFCAT) is a direct performance-based assessment of IADL functioning that uses a computer or tablet interface and is appropriate for multiple populations. Unlike informant-based measures, the VRFCAT is completed by the study participant directly; an informant is not required. In order to evaluate the sensitivity of the VRFCAT to the earliest declines in self-reported cognitive function, our team at VeraSci partnered with academic colleagues to recruit and evaluate 245 healthy young adults (age 20-54) and 308 healthy older adults (age 55-97). Older adults were screened for subjective cognitive decline using the Cognitive Functional Instrument (CFI, also referred to as the ADCS Mail-In Cognitive Function Screening Instrument (MCFSI). The questionnaire was designed to assess recent changes in cognition and functional activities that are commonly affected in the development of MCI. Furthermore, increased CFI scores have been associated with amyloid burden in healthy older adults, suggesting that this self-reported measurement serves as a useful screening instrument for preclinical AD. Of the 308 older adults assessed, 61 met the criteria for Subjective Cognitive Decline based on CFI scores greater than or equal to 4. Our results demonstrated that the VRFCAT is sensitive to the deficits of in older adults with subjective cognitive decline, as they performed significantly worse than age-matched normative controls on all VRFCAT endpoints. Both groups performed significantly worse than healthy younger adults (age 20-54). Participants with subjective cognitive decline also performed significantly worse than controls on cognition as measured by the Montreal Cognitive Assessment (MoCA) and Brief Assessment of Cognition (BAC) verbal memory. All VRFCAT summary measures had correlations greater than r=0.5 with MoCA performance and assessments of Verbal Memory (p<0.01 for all), suggesting consistency between VRFCAT performance and key cognitive indicators of decline in MCI and AD. Full results are reported in the current issue of the Journal of Prevention of Alzheimer’s Disease. Welcome to the third and final installment of our three-part blog series highlighting the importance of choosing the right language services partner. Cultural adaptation and localization of clinical trial translations can be pivotal components to the success of a clinical trial. Localization and cultural adaptation go beyond textual translation and modify content for regional and/or local consumption. Localization modifies content and elements of a trial to appeal to patient’s cultural preferences in their own local language. Cultural adaptation and localization services are just as important as translation services to accurately represent the implementation and outcomes of a clinical trial. Cultural adaptation can improve the quality of formally translated instruments by ensuring tasks, stimuli, instructions and, scoring are appropriate for populations of interest. Detailed attention to these issues is likely to enhance any real signal in a clinical trial, where the translated instrument serves as an endpoint. The notion of Santa Claus is not a uniquely American tradition. 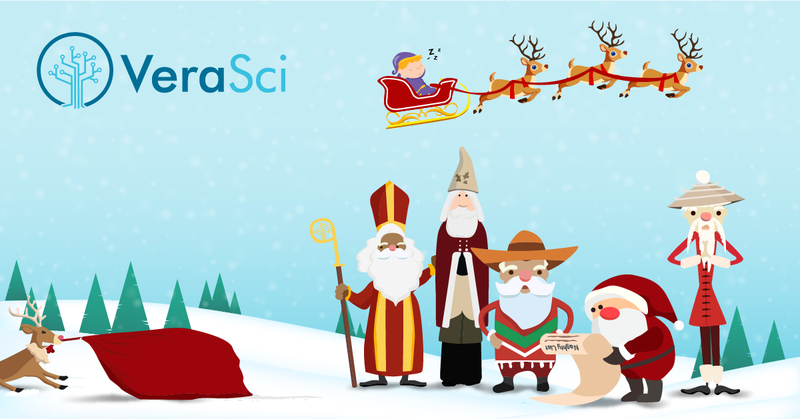 In fact, many countries and cultures around the world celebrate the tradition of Santa Claus although symbolism, languages and, customs differ greatly. Using VeraSci’s methods for cultural adaptation, errors can be identified and corrected prior to use in clinical trials, yielding gains in the reliability and validity of translated instruments and avoiding costly delays. Our linguistic experts bring not only translation skills and cultural awareness to each project, but clinical trials experience as well, ensuring that the information provided does what it should do: enable trial participant understanding. Accurate translation, interpretation, and cultural adaptation are vital to a successful global clinical trial. By working together with sponsors, regulatory committees and other suppliers of research-related services, VeraSci can cut costs, help you to meet critical trial deadlines, and ensure successful international clinical trials. Quality: KPI of 99% first-time accuracy for all translations done by humans. Our unique workflow includes quality assurance oversight by a team of PhD-level scientists as well as in-house software development and information technology teams, ensuring that the complexities of medical and technical terminologies are correctly translated. Clinical Trial Expertise: Our linguists are often specialists in their field and are considered subject matter experts. They must pass a stringent nationally and internationally recognized certification process and are supported by a team of PhDs and clinical professionals to guarantee scientifically accurate translations at all times. VeraSci has extensive experience in executing large multi-year projects around the globe and is dedicated to ensuring the highest level of language services delivered at the pace to support global clinical trials. Customer Satisfaction: At VeraSci, we go beyond the industry standard to provide a higher level of translation accuracy and agility by delivering customer-focused solutions and processes. Competitive Pricing: VeraSci’s long-term relationships with our expert team of linguists allows us to obtain lower cost, giving us the flexibility to meet client requirements and customize project approach to meet budget requirements. Welcome to the second installment of our three-part blog series highlighting the importance of choosing the right language services partner. Interpretation goes beyond the word-for-word translation of a spoken or written message. Sentence structure differs from language to language, and word-for-word translations often make very little sense to the target audience. Interpretation is all about paraphrasing. Interpreters need to transpose the source language within context while preserving its original meaning. Rephrasing jargon and culturally-specific expressions in ways the target audience can understand is part language skill and part cultural awareness. Interpreters deliver their messages on the spot with no help from scripts, dictionaries, or other reference materials. They rely solely on their experience, memory, and agile reflexes. Poor and inaccurate interpretations can damage the validity of data and create roadblocks to meeting critical deadlines. In addition to the stringent nationally and internationally recognized certification process required of all VeraSci interpreters, many of them are specialists in their field and considered subject matter experts. A considerable number have direct clinical trials experience, bringing context that elevates accuracy and understanding. In settings like an Investigator Meeting for a global clinical trial, it is absolutely crucial that all sites receive consistent information to ensure that the data collection process does not deviate from the standard. Because of their clinical trials experience, VeraSci interpreters understand the nuances required in interpreting instructions so that site personnel perform trial-related tasks consistently and data quality is protected. In addition to interpretation services, VeraSci specializes in translation, localization, and training in over 150 languages. Check back next week to learn how localization and cultural adaptation can help to enhance any real signal in a clinical trial.